A few months ago, I designed a Sherpa-lined Winter Baby Bonnet to protect my infant daughter from the hibernal elements. Now as the seasons are changing, I realize that my winter baby is, well, still a baby. She is still in need of a hat to protect her delicate skin, now, from the bright sun of these warmer days! 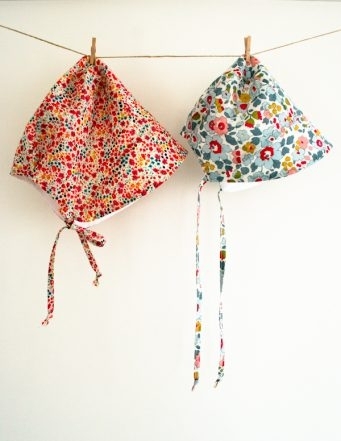 But, I’ll admit, that when designing this Baby Sunbonnet, I had more than just practicality in mind. I’m a sucker for a baby in a classic bonnet! I love how the visor and chin ties create the perfect silhouette, allowing just her chubby cheeks to peak out. 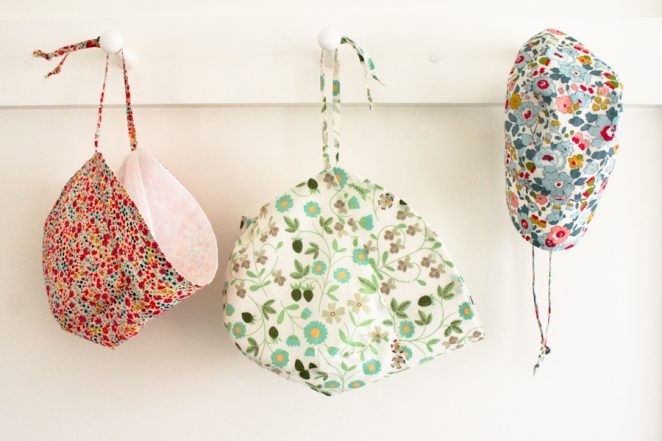 And, in Liberty of London prints, these hats are as timeless as they are sweet. 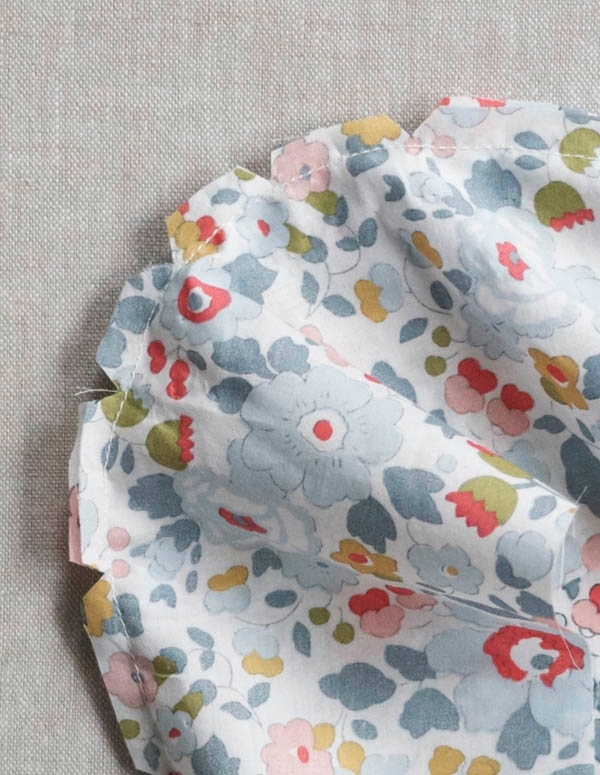 Outer Fabric: ¼ yard Liberty of London’s Tana Lawn. I used Light Blue Betsy (shown above), Phoebe Poppy and Mint Maribelle. These are enough materials to make one hat in any size. Use the prepared template to cut one Visor from the Outer Fabric, the Lining Fabric and the Interfacing. 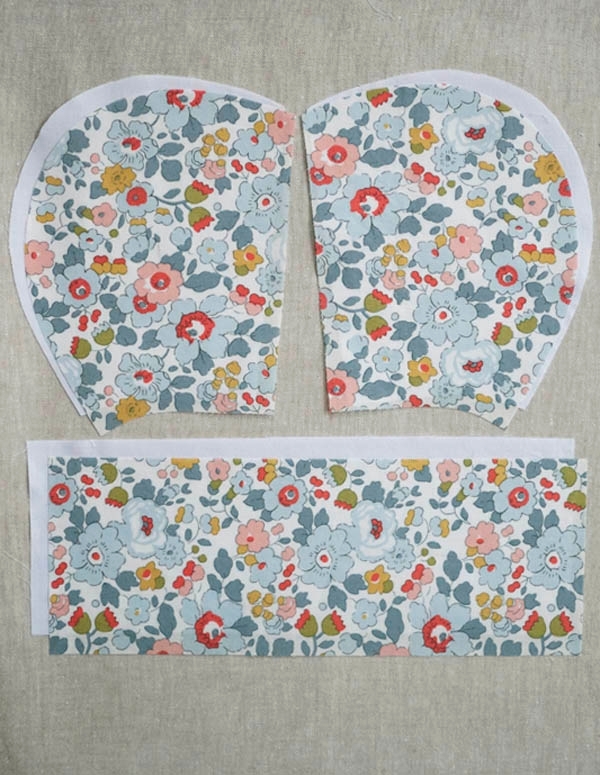 Use the prepared template to cut two Hat Sides from both the Outer Fabric and the Lining Fabric. Cut one Hat Side with the right side of the fabric facing up and one with the wrong side of the fabric facing up. The two Hat Sides from the same fabric should be mirror images of each other. Cut one 3 ½ by 9 ½ (3 ½ by 10 ¼, 3 ¾ by 11 ¼, 3 ¾ by 12 ½, 3 ¾ by 12 ¾)–inch rectangle from both the Outer Fabric and the Lining Fabric. From the Outer Fabric, cut two rectangles 1 1/8 inch wide and at least 12 inches long. These will be the Ties. The longer you cut the rectangles, the longer the Ties will be. Note: For this section use only the Outer Fabric pieces. With right sides facing, pin one long edge of the large rectangle to the long outside curve of one of the Hat Sides. It can be tricky to keep curved seams wrinkle-free, so use a lot of pins to ensure that the seam will come out un-puckered and smooth. Sew around the pinned curve. This is a Side Seam. Cut notches in the seam allowance along the curve. Repeat with the other Hat Side and the other long side of the rectangle for the second Side Seam. This is the Outer Hat. With right sides facing, line up the straight edge of the Visor with the straight front edge of the Outer Hat. Pin in place. Press the seam towards the Outer Hat. Trim off ¼ inch from the straight edge of the Interfacing Visor. 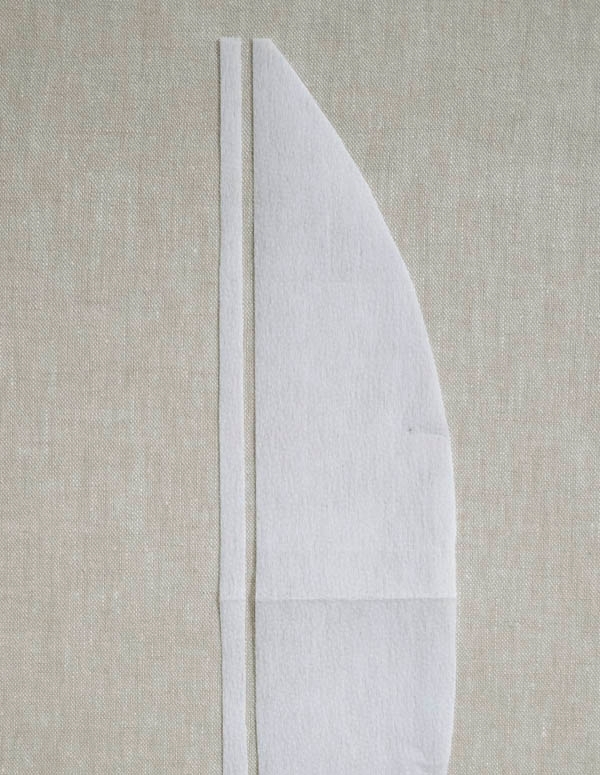 Line up the trimmed, straight edge of the Interfacing Visor with the straight edge of the Lining Fabric Visor. Fuse in place following the manufacturer’s instructions. Note: For this section use only the Lining Fabric pieces. Piece the Hat Sides, Rectangle and Visor in the same way that you pieced the Outer Hat. 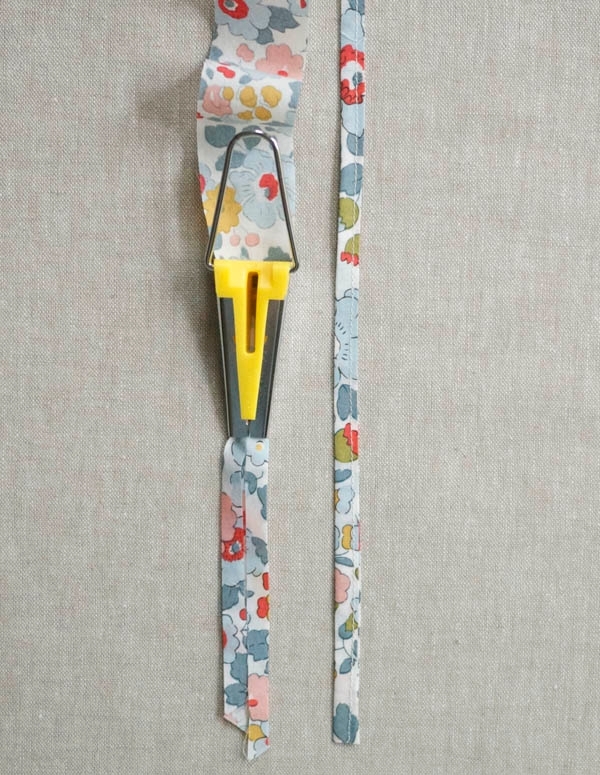 Using the two small rectangles of Outer Fabric and the 12mm bias tape maker, follow the manufacturer’s instructions to make two single fold strips of tape. Fold each piece in half lengthwise, press and edgestitch along the long open sides. At one end of each strip, tie a small knot to finish the ends. Pin the short raw edge of a Tie to the raw neck edge of the Outer Hat at the Visor seam. Sew in place with a 1/8-inch seam allowance. Repeat with the other Tie on the other side of the Outer Hat. With right sides together, slide the Lining inside the Outer Hat. Pin the pieces together along all edges, making sure the Ties are tucked between the layers. Sew around the pinned edge, leaving the end of the rectangle at the nape of the neck open. Backstitch at the beginning and end of the seam. Pull the Hat right side out through the unsewn gap. Press the edge flat. Sew the gap at the nape of the neck closed using a ladder stitch. For detailed instructions and photographs, please check out the Winter Baby Bonnet project here and scroll down to the “Finish” section. 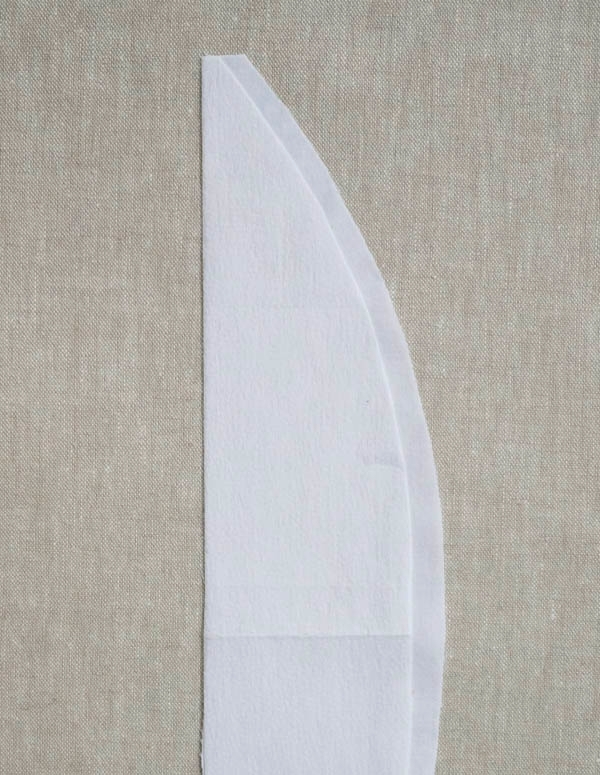 Fold one Side Seam at the nape of the neck towards the Visor ¼ inch so it makes a small pucker. Hand sew the fold using a slip stitch and work from the neck edge up ¼ inch. Huge Spring Cleaning Sale at purlsoho.com! Can you post a video? The directions and pictures are hard for me to understand. Thank you for your request! Unfortunately we do not have the resources to make a video for this pattern, but we will keep your request in mind for future projects! Let me know if you have any other questions! Thanks for writing in! All of the instructions for this lovely bonnet are included above. If you are interested in printing the instructions you can do so. Excellent pattern, thank you! I made a gorgeous bonnet for my little one for next summer. I wanted to let you know the link to the Winter Baby Bonnet project listed in the instructions is broken. I improvised for my project, but also was interested in seeing the Winter Baby Bonnet! Thank you so much for writing in! With right sides facing, you’ll pin one long edge of the large rectangle to the long outside curve of one of the Hat Sides. Then you will sew around the pinned curve, using a 1/4-inch seam allowance. Next, cut notches in the seam allowance along the curve. Finally, you’ll repeat with the other Hat Side and the other long side of the rectangle, creating the second Side Seam. So, essentially the rectangle piece is sewn between the two Head Side pieces. Does that make sense? Please let us know if you have further questions. Again, thank you for writing in! i love the pattern but please can you let us know what seam allowance you used? Thank you for your question! We used a 1/4-inch seam allowances unless otherwise noted. Please let us know if you have further questions! Thank you for writing in! 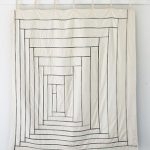 can this be sewed by hand? Thanks for writing in! This pattern can absolutely be sewn by hand! Thank you so much for writing in! I am not certain I understand your question. Are you asking about seam allowance? Or are you asking about what type of stitch we used to construct the sunbonnet? 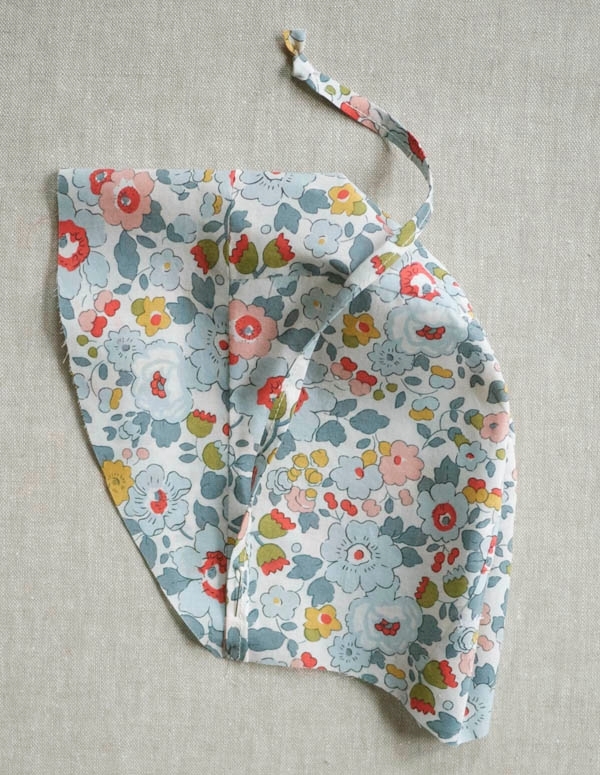 We used a ¼-inch seam allowances unless otherwise noted and a straight stitch to construct the sunbonnet. Love this pattern and made it successfully prior to the template revision. Since the revision, I had attempted to make it again and had problems with the rectangle side lengths being too long and not matching up with the new head side pattern pieces when pinning. This was probably in 2015. Have you since readjusted the rectangle pattern measurements to match the new bonnet pattern? Thanks for the comment and sorry we are getting to this so late. We were not aware that there was a revision on this pattern. Could it be that your printer is printing at a higher scale? I have made this several times and can say that I usually pin the beginning and end of stitching line first–then work my way to the middle. Otherwise the curved hat pieces can stretch along the bias and the rectangle piece is too long. When I go back and re-pin making sure not to stretch anything it works. I love this pattern! To save a little time I also just topstitch the bottom edge to close the opening and to secure the pleats. I found that hand sewing the rectangle to the two side pieces was definitely the way to go. After carefully pinning with LOTS of small appliqué pins–about every quarter inch–I was able to hand piece the 1/4 inch seam without a single tuck or pucker. 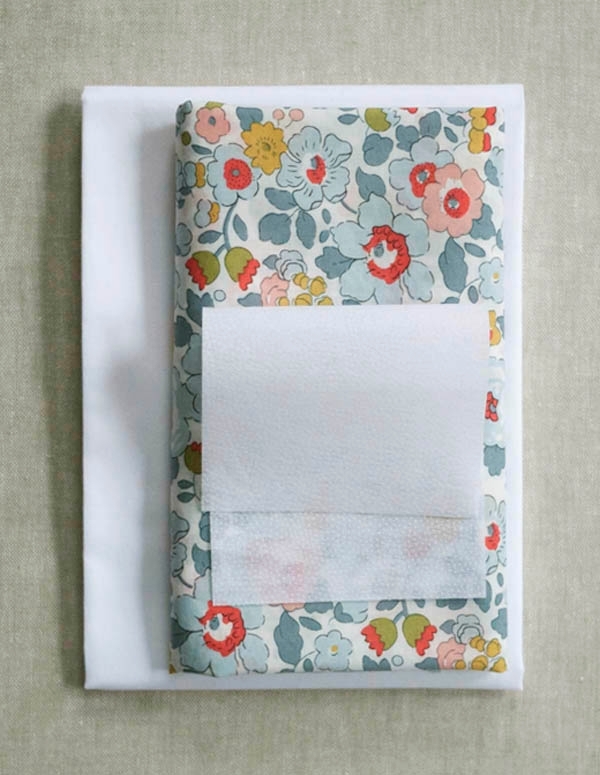 Another tip that worked for me: Liberty cotton lawn is very fine and soft. This made it difficult to feed the bonnet ties through the 12mm bias tape maker. The fabric was too floppity! So I sprayed the fabric strips very lightly with spray starch and ironed them dry. After that I was able to slide them through the bias tape maker without a hitch. Thank you so much for this tip! I am certain lots of folks in our crafting community will find this helpful! Hello! Thank you for the free pattern! This hat is exactly what I was looking for to make my daughter for summer. I’m in the process making it and have come to an issue with the visor being too long. I’ve checked my pattern and even cut out smaller visors on the pattern to see if it would fit the hat but no luck. Am I suppose to pin the visor to the hat a special way? Or is it all suppose to be right at the hats raw edge? Thanks for writing in! It’s hard to say without the project right in front of me. Could it be that you are pinning the wrong side of the visor to the front of the hat? The visor should be flush with the raw edge. Also, maybe the pattern piece was cut incorrectly. Let me know. I’d be glad to help in any way if you still can’t figure it out. Hi..cute pattern! I don’t see the darts as being on the pattern. Also the brim of the hat is too long to fit the bonnet. The scales on both are 1″, and I have measured them.. What are the rectangles? I thought I had read the entire tutorial, but pieces are mentioned here that I’m not aware of. Would you please clarify where everything goes, and where the pieces are, as well as where the darts go. Thank you so much! Cutting out these pieces should result in the brim fitting correctly. 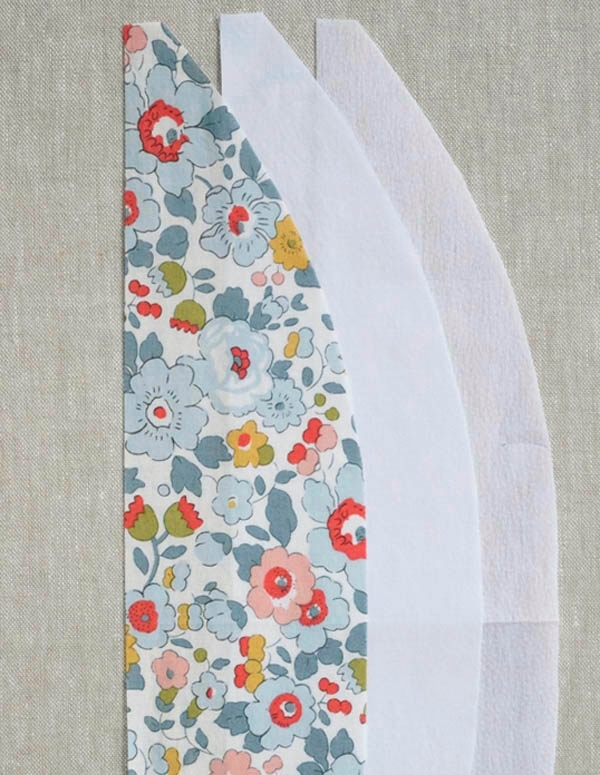 Additionally, these are no darts in this lovely little sunbonnet as the curved pieces are eased together as shown in the pinning image above. I hope that I was able to clear everything up! Hi I just ran into this same problem. Just move the visor to the other straight edge and you will be golden! In attached instructions I didn’t find rectangle as it in picture above, could add it in instructions? I hope this helps! Please let us know if you have any more questions! Do I need to cut these larger by 1/4″ on each side for a seam allowance, or are the seam allowances already included in the rectangle measurements? Thanks! Oh, and do I need to include a seam allowance for the bonnet sides? A comment below makes it seem like I don’t, but the instructions said to include one unless it says not to (and the pattern doesn’t say not to). Thanks! Thanks for writing in! The seam allowances are included in the pattern. 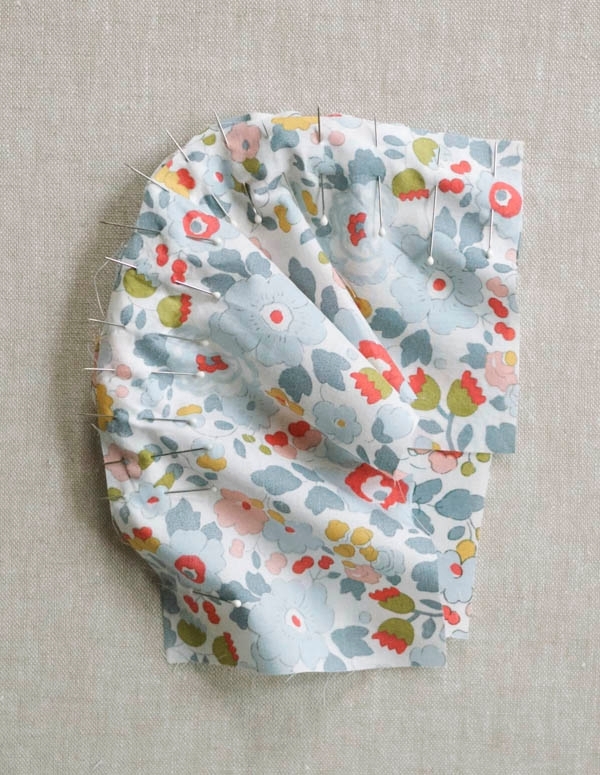 You will be using a 1/4″ seam allowance when you sew the pieces together but it is already included in the pattern pieces. So the seam allowance is included in the pattern, or should I add seam allowance? Thank you for writing in! The seam allowance is included in the pattern. Please let us know if you have any more questions! What are the corresponding head sizes in inches for the month sizes? My daughter has a big head so I can’t go by month. bosoir, je ne trouve pas le PDF a télécharger. pourriez vous m’aider ? You can download the pdf pattern by clicking the “print” icon. At the top left of the popup you can download as pdf. Hope this helps! Pouvez-vous m’envoyer le patron, je ne le trouve pas sur le site il y a le tuto mais je voudrais imprimer le patron. Thanks for the question. Thanks for the question. There is an option to download a PDF of the pattern in the pop-up box when you click the print button. You also have the option to print it if you want. Thanks! I sew it and it is beautiful! 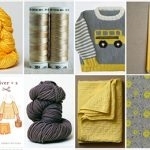 But I would like a pattern for 5T for my girl! Thanks for writing in! Unfortunately, we are unable to provide a sized up pattern at present be we will keep your request in mind for the future! i really wish there was a video tutorial of this!! hard to understand for someone who is new at sewing. great hat though i wish i could make it. Thanks for the suggestion! We will keep it in mind for the future! Thank you for the clear and detailed directions. The sun bonnet I made turned out beautifully and was a perfect fit. I love the bonnet but had trouble attaching the ties so I attached them on the outside by hand and covered the place of attachment with a white pearlized 4 hole button and contrasting thread . Hello – I just made one of these for my little grand-daughter … OMG, it is so adorable! Thank you for a terrific pattern! 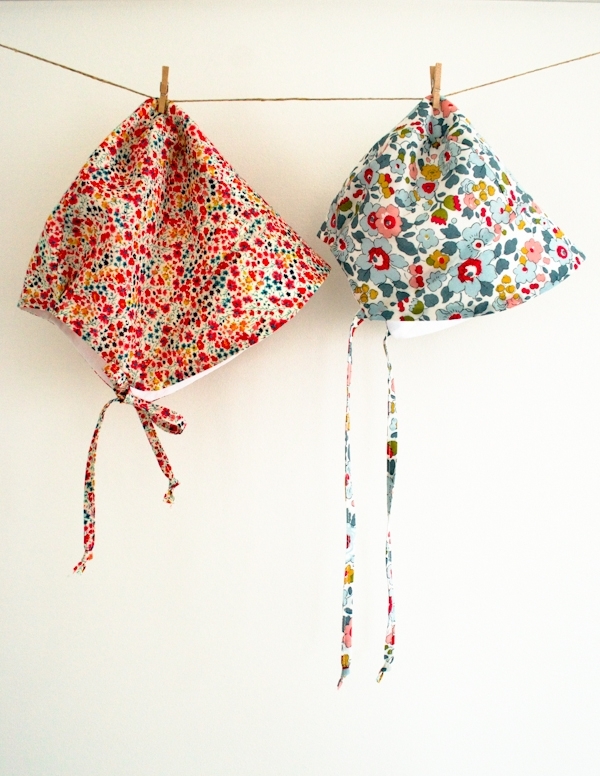 Made 2 of these cute bonnets for friends with little girls. Great step by step instructions. Even a beginner like me could manage this 🙂 Thank you! Thank you so much for this wonderful free pattern! It is really good for practicing stitching along rounded edges. Thanks to your pictures I noticed that I pinned my pins the wrong way – the way you do it, makes it a whole lot easier to sew rounded edges. I wondered whether to cut the visor parallel with the grainline. I couldn’t find any comment on the pattern. But maybe it doesn’t matter. Thank you for the kind comment! Glad you are enjoying the pattern and that it has been a good experience. I suggest you cut the visor on grain (parallel to the selvedge). This is how we did it but you can also cut it on the cross grain. Thanks again! I just finished this most adorable hat. Directions were PERFECT. Hat came out perfectly. I made the 6-12 month size. 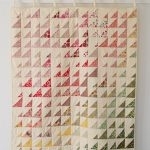 Thoughts on making this with regular quilting cotton as opposed to “lawn”. Thanks for writing in and for the kind words! The main difference between a lawn and a quilting cotton is that lawns are a lot more drapey due to their high thread count. This makes them quite a bit softer and more slinky. For this lovely little bonnet, you can certainly use quilting cotton as a little bit of structure is wanted to make the brim act as sun protection! 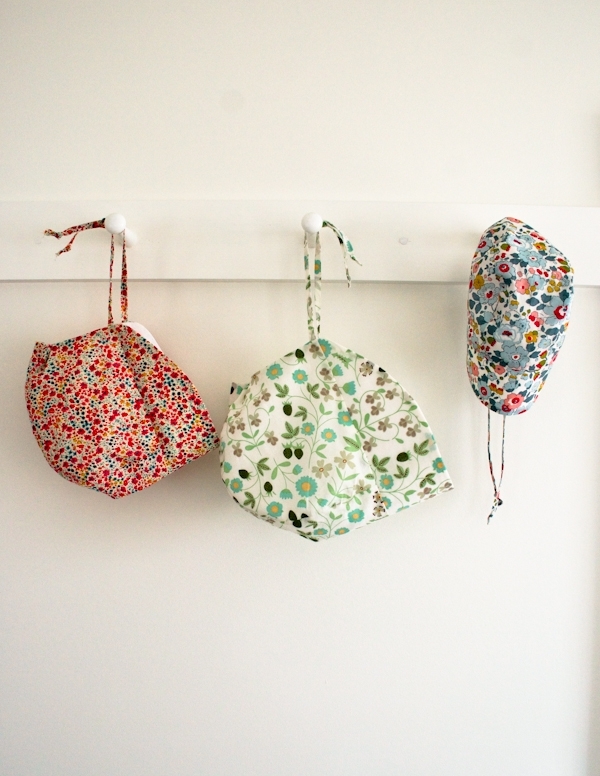 I just finished making the so cute sun bonnet. Thank you very much. It was quick, easy, and the tutorial helped a lot. Thanks for writing in! That is curious indeed. We just printed out the pattern in the shop and measured it and it is coming out to be 12 3/4″. However, if you are getting a larger measurement, I would suggest cutting to that measurement as it will fit your hat better. Please do let us know how it turns out! I just wanted to say that you are incredibly patient and good-natured about answering everyone’s questions/ responding to requests. Thanks for sharing this adorable pattern. Thank you so much for your kind words! We really appreciate it! I sent you a comment asking for help to download the pattern as I sent it to you my printer kicked in and the pattern printed. Sorry to have bothered you. I’m so happy to hear it! Let us know if you have any other questions. I love your bonnet and pattern as many friends of mine do. So I got the idea to duplicate and sell the hat in small amounts. Is this possible? 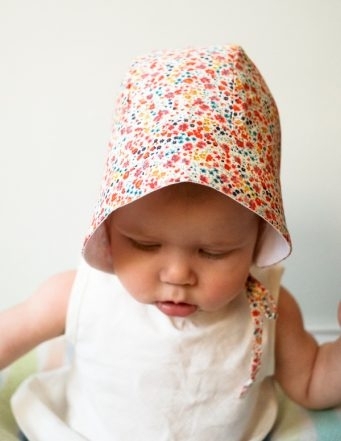 Thank you so much for your interest in our Baby Sunbonnet pattern. 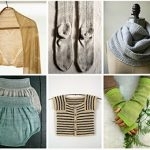 Unfortunately, all items made from our patterns cannot be sold. 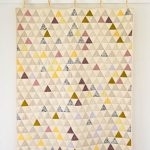 All of our patterns are copyrighted and are intended for personal home use only. We hope you understand. Thank you for getting in touch! Let me know if you have any further question. This was very easy to follow and turned out great! I made sure to pin a lot (I did about every 1/4″) when stitching the rounded edges as noted in the pattern and did not have any problems. I used satin ribbon for the ties and it worked great. I made this for my 16 month old daughter and it fit perfectly! Thanks so much for the free pattern! I’m just pulling my supplies together to make one of these. 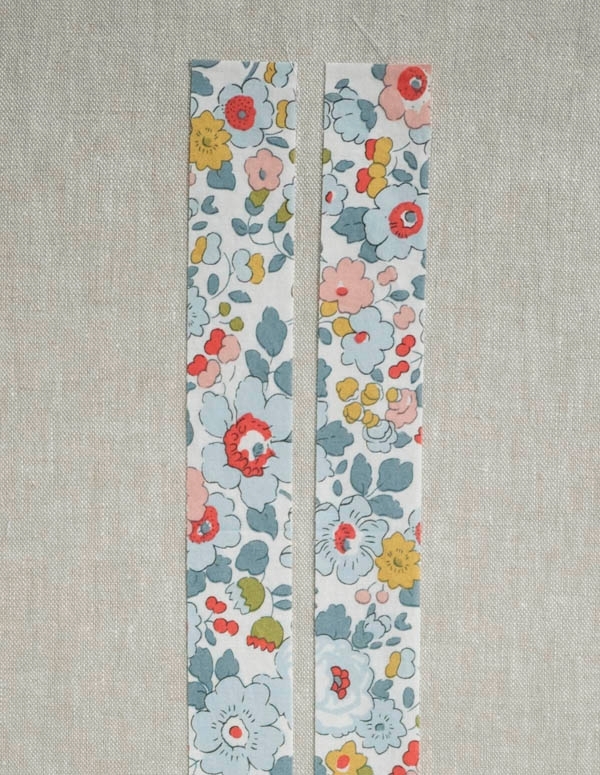 I can’t seem to source the Kaufman Cambridge lawn anywhere in the U.K. What do you suggest I use instead for the lining? Loved this pattern- worked like a charm and is SO CUTE! Thanks so much. I made the 18-24 mo size last year for my granddaughter. It was beautiful and both mom and baby loved it. My daughter-in-law would like me to make another one to fit the baby who is now almost 3. Any ideas of how I can adjust the pattern to make it a size or two bigger? I have a quick question regarding trimming the 1/4″ off of the straight edge of the interfacing for the visor. In the photos, even after trimming there is still a bit of a straight edge perpendicular to the trimmed edge, but based on my pattern pieces, after cutting the 1/4″ off I’m left with just a point. Is this correct? I did check that my pattern is printed to the right size based on the 1″ scale. Thank you for your help! technically it should have a straight edge, that part is then sewn in with the seam allowance. Since you have a point, You should be fine, you are using a fusible interfacing so it will stay secure on the lining fabric. 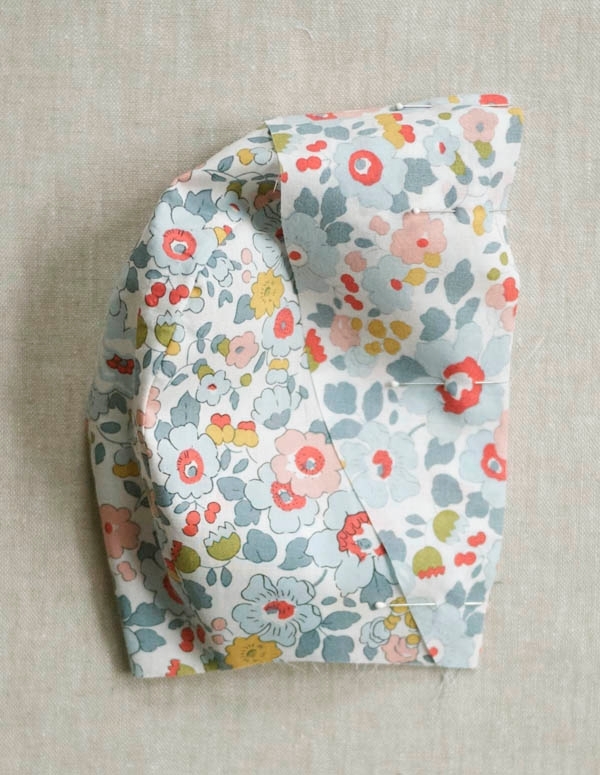 I just purchased fabric to make this tomorrow.. would the finished bonnet be reversible if I were to use two patterned fabrics? I am new to sewing so I apologize if this is a silly question! This is not a silly answer, you could definitely make this reversible if you used another patterned fabric, that would be adorable. Hello! Thank you for the beautiful and well-written patterns you share! I have made several of these bonnets so far, and I keep running into the same frustrating problem. My lining layer is too big to fit well without rumpling the outside of the bonnet! Am I doing soemthing wrong? Has anyone else had this problem? Should I trim the lining pieces a bit or just sew with a tiny bit bigger of a seam allowance? Thank you! Thanks for writing in! Oh dear! I am not sure what could be happening! The lining should fit snuggly in with the outside of the hat. You can certainly try cutting it a tiny bit smaller (I’d try 1/8″ smaller to start) and see if that helps! Just love the Baby Sunbonnet made my 10th hat from this pattern for my best friend’s two grandbabies! My great nieces all have them as well! Very similar to a pattern from the 40’s my mum gave me for a boy’s corduroy hat. I love this pattern. Thank you so much for making this pattern and tutorial. I want to try it soon. 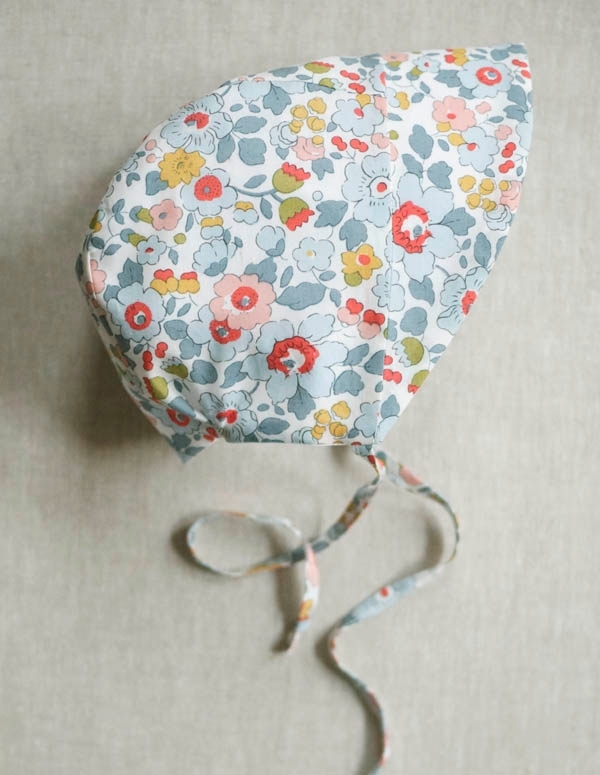 It looks like it could be easily made as a reversible bonnet. 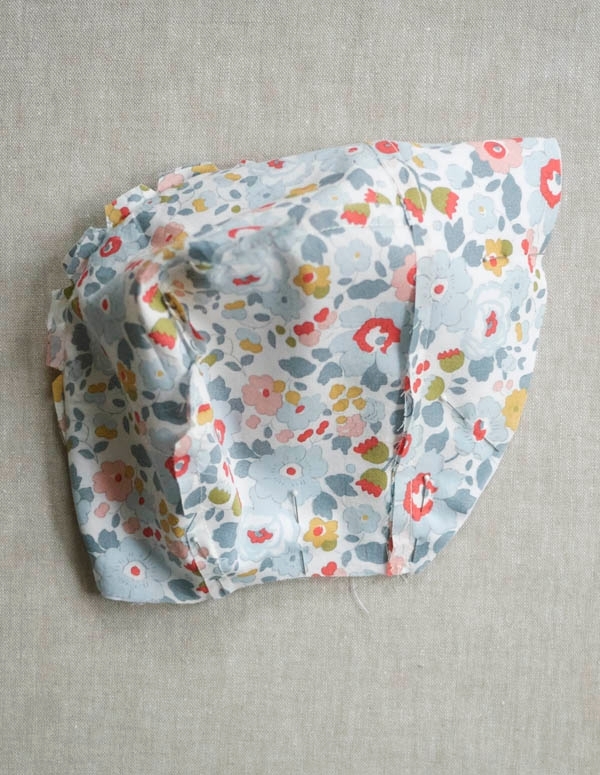 I finished making the bonnet today, using leftover fabric from the quilt I’ve made for my soon-to-arrive granddaughter. It came together beautifully, and I’m so pleased. I would suggest lightly marking the center of the visor and center pieces to make it easier to match them. Thanks for the lovely pattern! Thanks for writing in and I am sorry to hear that you are having difficulties! The strings are attached by sandwiching them between the right sides of the bonnet. Here we have attached them to the right side of the outer fabric and then sandwich the right side of the inner fabric on top of the right side of the outer fabric. 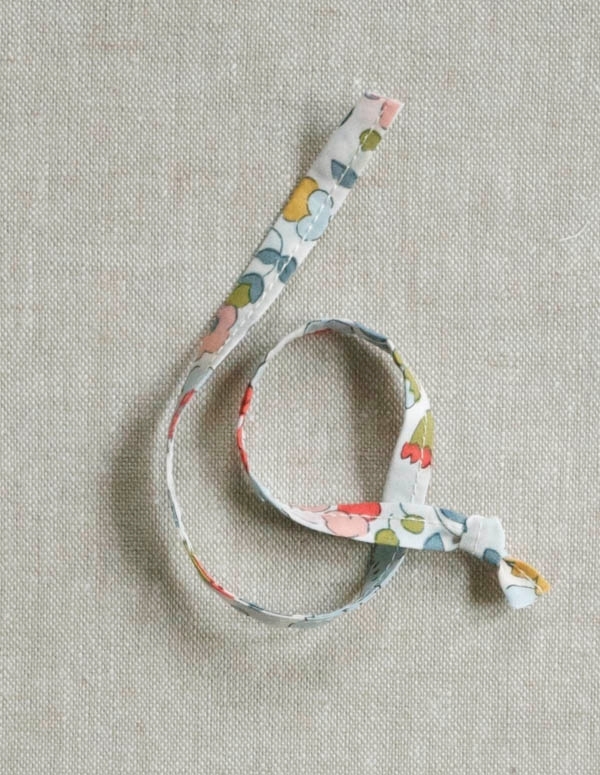 For easy of sewing, these are then flipped so that the wrong side of the outer fabric is on the outside and the wrong side of the inner fabric is on the inside with the strings sandwiched between these. I hope that this helps and please do not hesitate to reach out! Is the seam allowance taken away from the given pattern, or do I have to add tht much seam allowance TO the given pattern? Will this bonnet still be good enough without the visor? 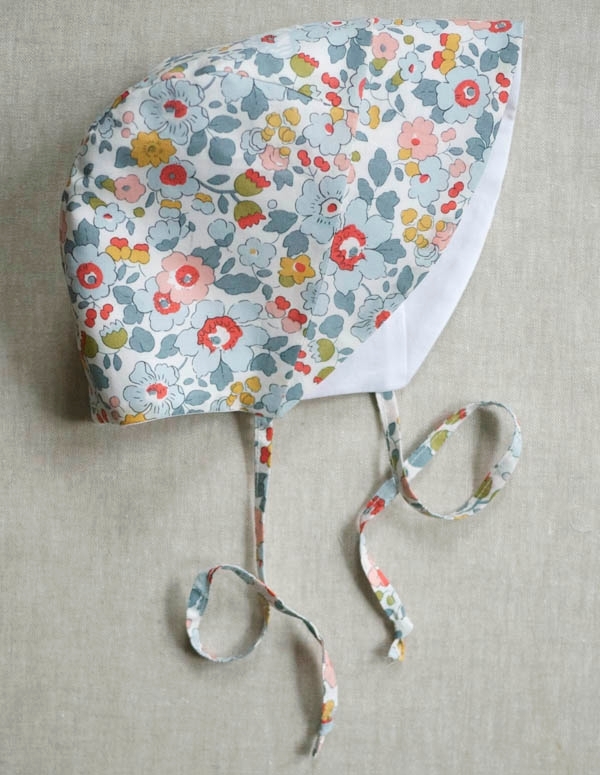 Or will the top part of the bonnet be too short for the baby’s head? Thanks for writing in! The seam allowances are included in the pattern! I do think that without the visor the bonnet would end a little too short on the head and make look a touch awkward. 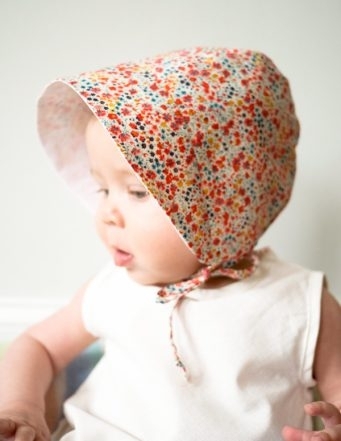 You may want to look at the Winter Baby Bonnet which does not have a visor and is quite sweet on a little baby head! Thanks for this wonderful pattern! 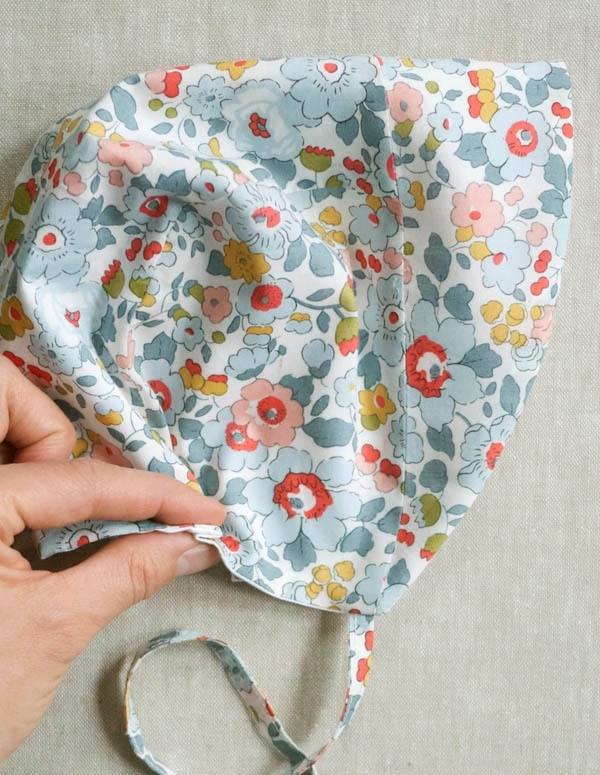 Easy instructions and brilliant finished bonnet. I’d love to be able to upload a photo of my baby blue seersucker and patterned peach cotton (ladybirds and flowers). My granddaughter looks lovely in it! Thank you so much for your kind words! We are always happy to hear when the items made are loved! Hello! Thanks for this cute pattern. I hope you can clarify the tuck at the neckline for me. I don’t want to complete the project without understanding. Is the “tuck” picked up from the seam so that the seam folds over? Or does it matter as long as there is a tuck in the same place on both sides? Also, when you say to stitch 1/4”, is that along the neck ? Or do you mean along the neck and then up the fold on the main part of the bonnet as well? Thanks again! Thanks for writing in! For the final fold at the nape of the neck, you will be folding bottom seam to bottom seam towards the visor. 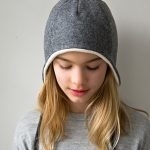 This just nips the neckline in a little and helps the bonnet stay on the head. I find that the picture in this section helps to illustrate it. You may want to blow it up a little bit by using Command + on a Mac or Control + on a PC. When is the interfacing for the lining attached? Immediately following the interfacing attachment for the visor? Thanks for writing in! For this lovely pattern, we only using interfacing for the visor and not for the lining or body of the bonnet. We think that this makes the bonnet a bit more soft with only the visor really needing the additional stability! The visor is too big and measured it several times. Either the pattern posted is wrong. I printed the pictures, etc. Some of the information is confusing to say the least. I am sorry to hear that you are finding this pattern confusing! The visor should fit correctly. There is an additional piece to the pattern that is not in the printed version as it is a simple rectangle for which a specialized pattern piece is not needed. If you look under the sections titled “PATTERN” you’ll find the instructions for cutting the rectangle under the second image and directly above the third image. Cutting out these pieces should result in the visor fitting correctly. For the final folds at the nape of the neck, do I stitch only on the outside of the bonnet, or do I stitch both on the inside and out? Thanks! Thanks for writing in! For the final fold in the nape of the neck, you will see through all layers of fabric!